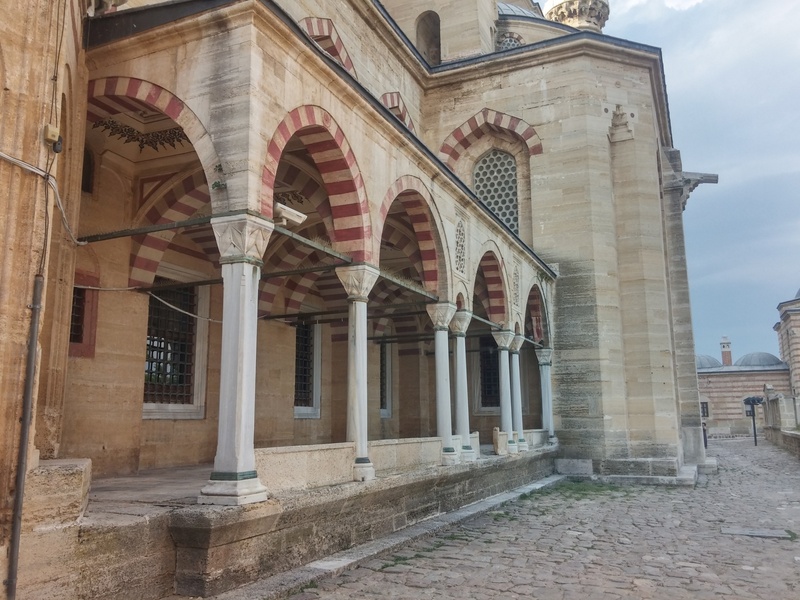 Selimiye Mosque is the most important and, at the same time, the most famous historical monument of Edirne - a city located in the European part of Turkey. This Ottoman imperial mosque was designed by Mimar Sinan, the most distinguished architect of the Ottoman Empire, responsible for the erection of more than 300 buildings, including bridges, medreses, and mosques. Selimiye Mosque was constructed between 1566 and 1574, on the orders of Sultan Selim II, also known as "Selim the Drunkard". Selimiye Mosque is considered to be Sinan's finest piece of work and the culmination of Islamic architecture in the Ottoman Empire. It was planned as a part of the entire architectural complex, known as külliye, consisting of the mosque, two medreses (theological schools), a covered bazaar called Selimiye Arastası, a clock tower, numerous courtyards and a library. The whole complex was inscribed in 2011 on the UNESCO World Heritage List, in recognition of architectural values ​​and harmonious connection of its elements. The mosque was erected on the orders of Sultan Selim II. Selim was stationed in Edirne as a prince when his father, Suleyman the Magnificent, campaigned in Persia in 1548. He also enjoyed hunting on the outskirts of the city. 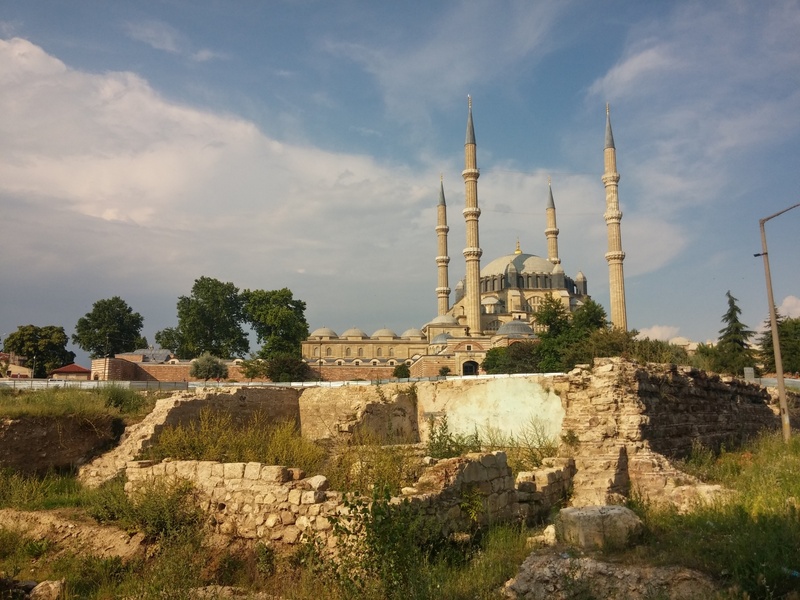 His love of Edirne, the palace on the Tunca River, and extensive hunting grounds were the reasons why he selected this city rather than Constantinople, as the site of his imperial mosque. Moreover, Edirne was the first major city that Europeans travelling to the Ottoman Empire reached after the journey through the Balkans. Building a large mosque complex there offered the Sultan an opportunity to use monumental architecture to impress the visitors with the greatness of the Ottoman Empire. The exact location of the new structure was decided personally by Sinan, the chief architect of the Ottoman Empire. Although there was a higher and more spectacular hill, called Kiyak Tepe, he selected Sari Tepe that occupies a dominant position over the Edirne Plain. The reason for this choice was simple - Sinan was more familiar with the geological conditions of Sari Tepe as he had built a water cistern there, 50 years before. He also took into account two facts: that the bedrock was 20 meters below the surface and that Edirne was situated in an earthquake zone. 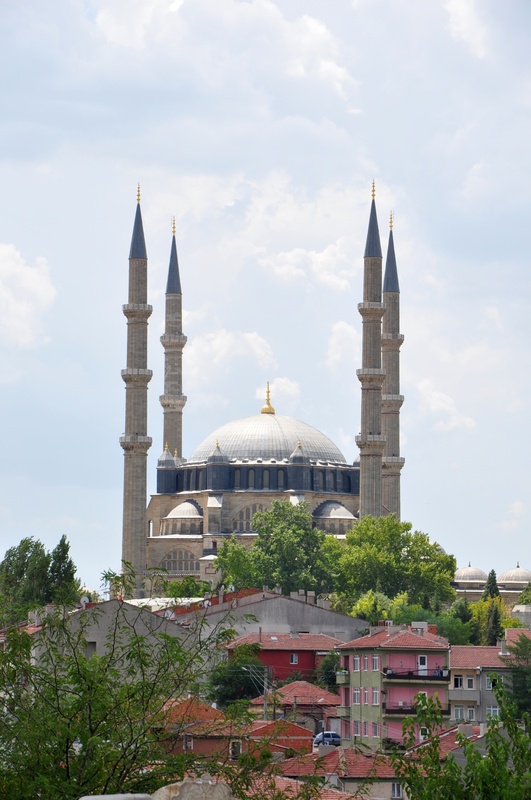 Sinan planned the Selimiye Complex to fit the cityscape of Edirne, as the mosque was erected in proximity to two other mosques - Old Mosque and Üç Şerefeli Mosque. Sinan also designed the buildings surrounding the complex in the way that gave scale to the mosque and the square, including a commercial centre (kapan) to the south and ten stone houses on the northern side. Unfortunately, kapan was demolished in the 40-ties of the 20th century, and the stone houses have been only partially preserved. Selimiye Complex underwent several renovations over the centuries. 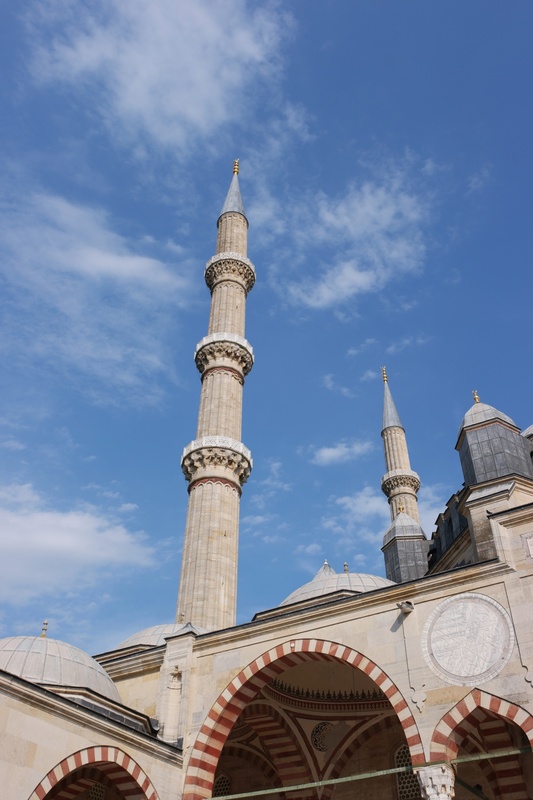 In 1584, Sinan conducted minor repairs after the mosque was damaged by lightning. In 1752, as a result of an earthquake, the balconies of one minaret and some windows were damaged. In 1808 some of the calligraphies decorating the mosque were renovated. At the same time, a roof was built over the fountain in the courtyard, but it no longer exists. Between 1839 and 1861, during the reign of Sultan Abdulmecid I the interior was plastered and then covered with new ornaments, in some cases mimicking the original designs. In 1874, the lead from the roof of the bazaar was removed for the production of ammunition, and the building was covered with roofing tiles. During the Turkish-Russian War (1877-1878), Edirne was occupied by the Russian army. One of the Russian officers plundered some of the glazed tiles and carved decorations from the sultan's lodge. 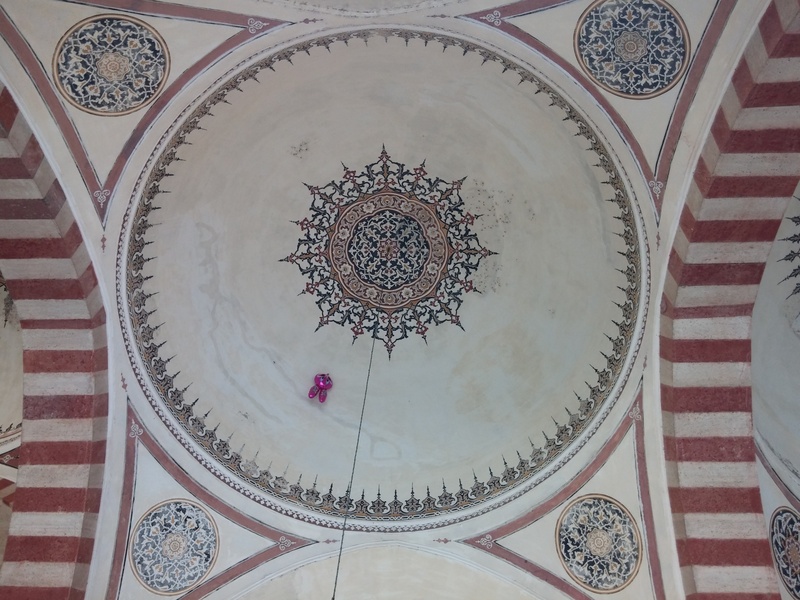 In 1913, during the siege of Edirne by the Bulgarian army, the dome of Selimiye Mosque was damaged by artillery. Thanks to the extraordinary strength of the structure, the mosque was not destroyed, and the trace of the damage was left unrepaired at Atatürk's command, as a warning to future generations. At the end of the Second Balkan War, some of the oldest carpets from the main prayer hall were stolen by fleeing Bulgarians. In 1925, at the request of Atatürk, Dar'ül Kurra Medrese was converted into a city museum. After the Second World War, it served as an office, a student hostel, and a warehouse. Now, it functions as Selimiye Foundation Museum. In 1936, the Dar-ül Hadis Medres was converted into an ethnographic museum. It hosts the Turkish and Islamic Art Museum since 1971. In the 1930s, the mosque was damaged by several storms. The damage after the storm in 1930 was repaired immediately, and the damage after the storm in 1932 was repaired only during the thorough renovation of the mosque in the years 1950-1955. During this work, some of the original interior decorations were uncovered. Further renovation of the mosque, conducted mainly to restore the original appearance of the interior and provide stabilisation of the dome, took place between 1978-1983 and 1983-1985. The works conducted in the years 2004-2008 focused mainly on the exchange of the minarets' roofs. The concept of a complex of public buildings surrounding a mosque was an Ottoman invention. Earlier, only the combination of a mosque and a medrese had been used in Islamic architecture. Adding a hospital, a soup kitchen, a hotel or a bath to this set was a uniquely Ottoman tradition. In the earliest such complexes, buildings were haphazardly erected near each other, without any general plan. After the conquest of Constantinople, the complexes were built according to a rigorously symmetrical plan. It was about to change in the times of Sinan - as he started building mosque complexes in accordance with the topography of the selected sites. The result was neither a haphazard labyrinth nor the strict symmetry but such as the 20th-century philosophy of architecture described as organic. 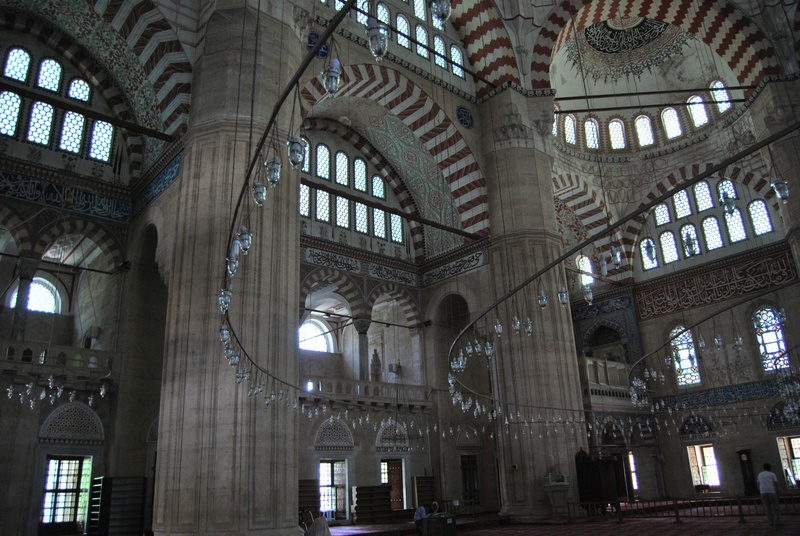 Sinan's masterpiece - the Selimiye Mosque Complex - is an excellent example of this philosophy. It consists of a central mosque and two medreses in the southern and eastern corners. On the western side, there is a 5.5 drop of the terrain. 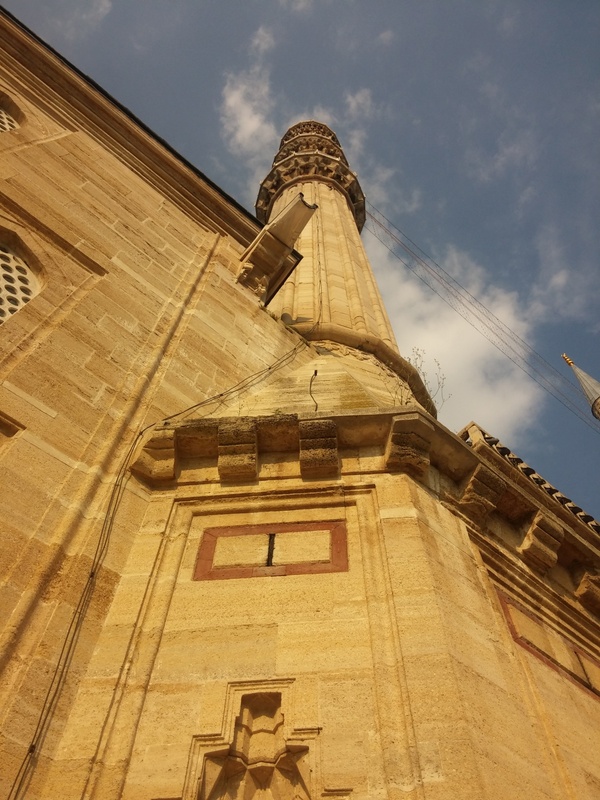 Therefore, Sinan added a terrace to build the mosque and the medreses on level ground. This element was later hidden by a covered market, built along the whole length of the terrace - 225 meters. The covered market, originally called Kavaflar Arastası, was erected as a source of income for the mosque and other institutions of the Selimiye Complex. It remains uncertain whether it was designed by Sinan or his successor - Davut Ağa. Most probably the design was created by the great architect Sinan himself, but the construction of the market was finished by Davut. The name of the market - Kavaflar Arastası - means the Cobblers' Arcade as it was initially occupied by the guild of shoemakers. The mosque was erected on a level platform known as the Square of the Poplar (tr. Kavak Meydanı) where the Old Imperial Palace had been erected at the end of the 14th century. This platform is 190 long and 130 meters wide. 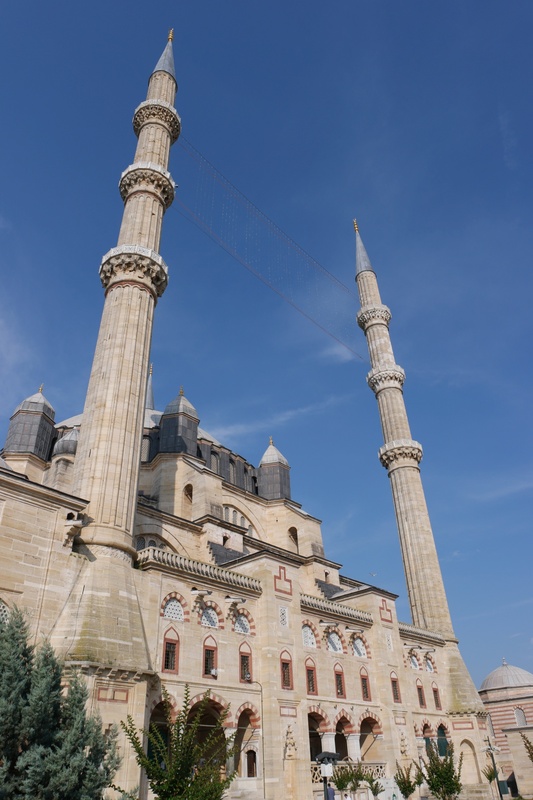 As Edirne is a flat city, Selimiye Mosque was planned on a monumental scale, dominating the cityscape. It was visible from every corner of the city. Four minarets of the equal height emphasised this effect. On the other hand, the access ways to the mosque were planned in the way that allowed the visitors to see only a fraction of the building. The main entrance is through the covered market, and the back entrance leads the visitors through a narrow passageway. Because of this solution, there is an element of surprise and rediscovery of the mosque scale and grandiose as one enters its courtyard. The courtyard (tr. avlu) adjacent to the mosque has the same dimensions as the main building of the mosque. In the middle of the courtyard, there is a sixteen-sided white marble ablution fountain. The courtyard has entrances on three of its sides and is surrounded by a colonnade. The peripheral colonnade supports 19 domes of varying sizes. The smallest domes are located on the arcades furthest from the mosque, the medium ones - on the side arcades, and the largest ones - resting on octagonal drums - decorate the main porch of the mosque. The entrance to the mosque is designated by the largest dome, and the door leading to its interior is decorated with a muqarnas. The mosque is decorated with brick arches and domes covered with sheets of lead. External walls were erected of sandstone blocks of honey colour, with elements of red sandstone framing the windows and forming geometric patterns in the lower part of the buttress system. The outer arches are made of alternating red sandstone and white marble. The main prayer room is on a rectangular plan with the dimensions 60 meters to 44 meters. It is covered with a dome with a diameter of 31.3 meters. The height from the floor to the highest point of the dome is 43.5 meters. Therefore it is much lower than the dome of Hagia Sophia (55.6 meters). Sinan believed that the dome of Selimiye Mosque was larger than the dome of Hagia Sophia. His claim was not entirely valid as in Hagia Sophia both the diameter and the elevation of the dome above the floor surpass those of the Selimiye. The octagonal shape of the dome's support most probably resulted from the influence of the tomb of Öljeitü in Soltaniyeh (now in Iran) that Sinan had visited during the Baghdad campaign of Sultan Suleyman. Around the great dome, there are numerous semidomes, arranged in a cascade and giving the mosque a pyramidal silhouette. The structure is based on eight huge ribbed piers supporting the massive dome. This solution allows the realisation of the original assumption of Sinan as he wanted to build a mosque in which the mihrab (i.e. a niche showing the direction of Mecca) is visible from anywhere inside the mosque. The mosques that had been built earlier were limited by a segmented interior. Therefore, the effect of vast space inside Selimiye must have been stunning for the worshippers. The mihrab is located in the centre of the south-eastern wall. Its niche is decorated with ceramic tiles from İznik. Because the mihrab is pushed back into an alcove, there is enough space to allow for window illumination from three sides. Because of this solution, the effect of making the tile panels of its lower walls sparkle with natural light was achieved. The tall, narrow mihrab is made of marble from Marmara Island and its topped with stalactite decorations - so called muqarnas. On the right side of the mihrab stands a richly carved marble minbar, from which Friday sermons are delivered. The platform for the muezzin (tr. müezzin mahfili) rises beneath the centre of the dome above the symbolic marble fountain of life. It is not a typical location as these platforms were usually placed in the back of a mosque. The central position of the platform allows for optimum use of acoustic conditions, does not disturb the symmetry of the interior, and allows discussion with the listeners. The lower level of the mosque lies in the darkness. This effect was achieved by arranging the windows in the way that prevents the light from reaching the lower part of the interior. On the other hand, in the galleries, huge windows let in plenty of light, drawing the attention to the dome. The sultan's lodge, located in the north-eastern corner, is adorned with ceramic tile displaying floral and geometric motifs. There is the motif of a tulip symbolising the God, apple trees and blossoming fruit trees. The design of these tiles is attributed to Sinan. The dome and interior walls are decorated with calligraphy and geometrical designs, most of which are painted in hues of pink and blue. However, the original appearance of the interior’s decoration was different from what can be seen nowadays. It was repainted many times and extensively renovated in the 20th century. Luckily, beautiful polychrome Iznik tiles, whose motifs include leaves and clouds, have remained largely untouched since the 16th century. The mosque is decorated with four minarets, each 71 meters high and each equipped with three balconies. 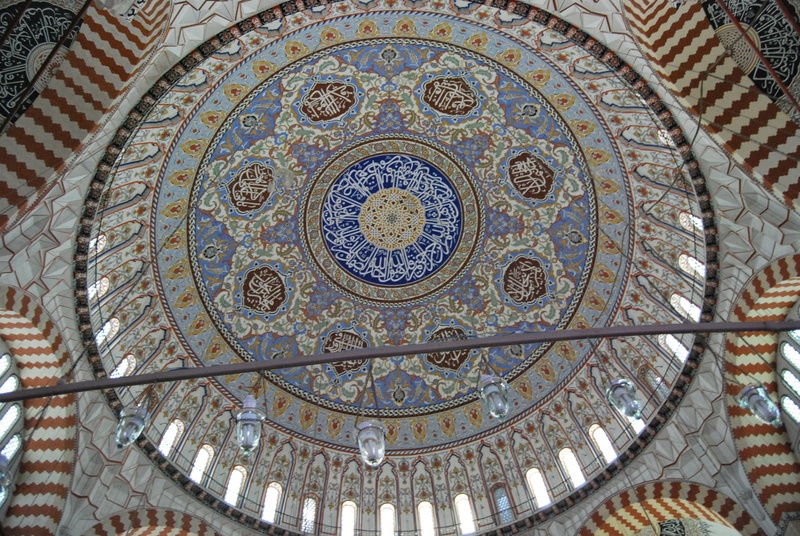 It is an architectural reference to another historical mosque in Edirne - Üç Şerefeli Cami. 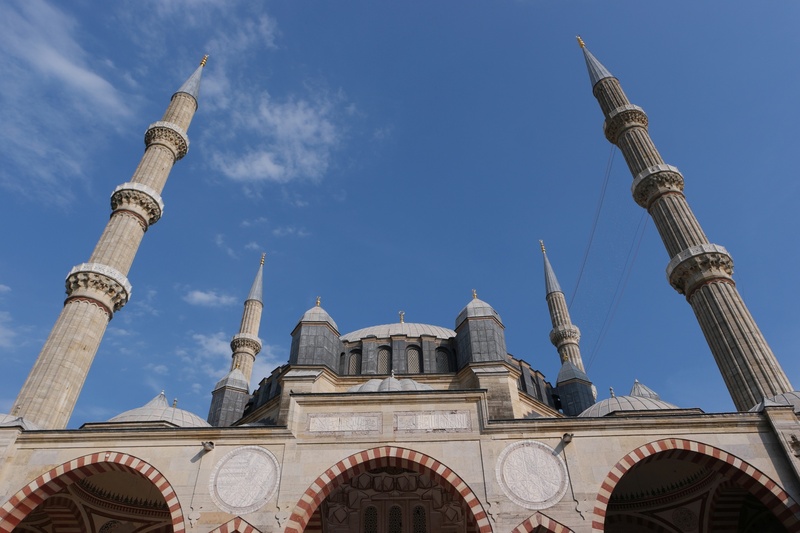 The thin minarets visually increase the apparent height of Selimiye Mosque. Two of them - on the northern corners - have three separate spiral staircases, leading to each of three balconies. Sultan Selim II who commissioned the mosque, died one year before its construction was finished. He was only 51 at the moment of his death and supposedly fell over in the bath with fatal results. 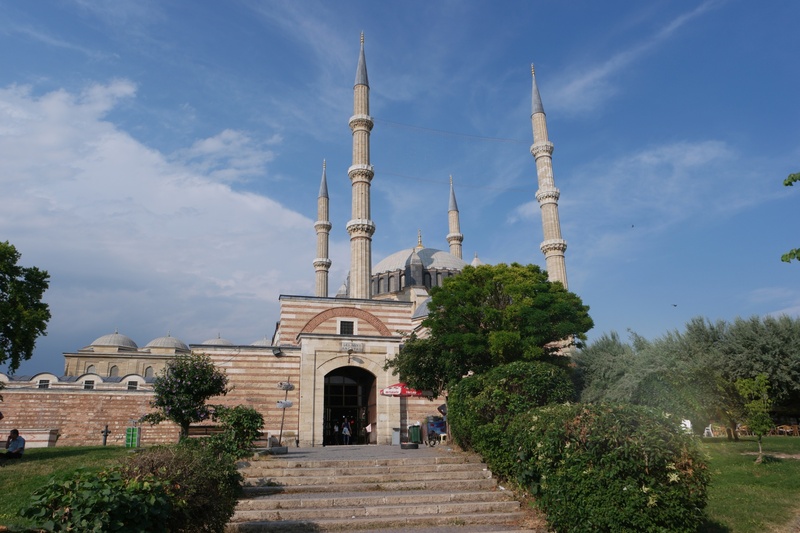 On the other hand, the architect of Selimiye - Sinan - was 85 years old when the mosque was ready. He lived to the ripe age of 98, extremally content with the result of his work in Edirne. 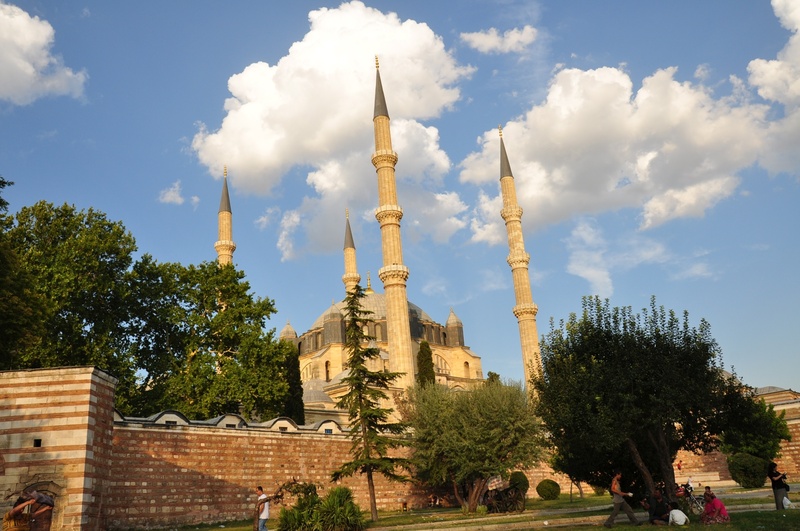 Despite the popular belief, Selimiye's minarets are not the highest or second highest in the world. Each of them is 70.89 meters high, and their slender silhouette makes them look even taller. However, numerous mosques boast higher minarets, including Hassan II Mosque in Casablanca, Morocco (210 metres), Sultan Salahuddin Abdul Aziz Shah Mosque in Shah Alam, Malaysia (142.3 metres) or Putra Mosque in Putrajaya, Malaysia (116 metres). 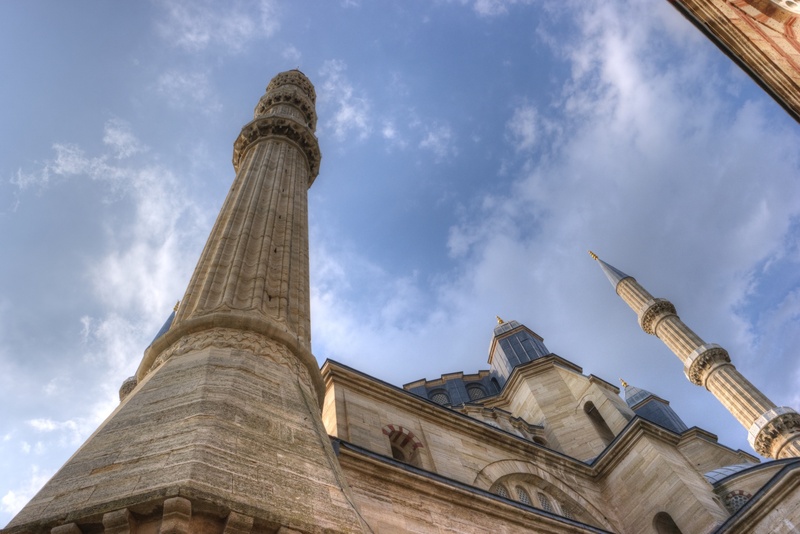 The highest minarets in the area of Turkey belong to Çamlıca Mosque in Istanbul (107.1 m) and the second place belongs to Sabancı Central Mosque in Adana (99 metres). On the other hand, the minarets of Selimiye Mosque were most probably the highest in the world when the mosque was completed in 1575. 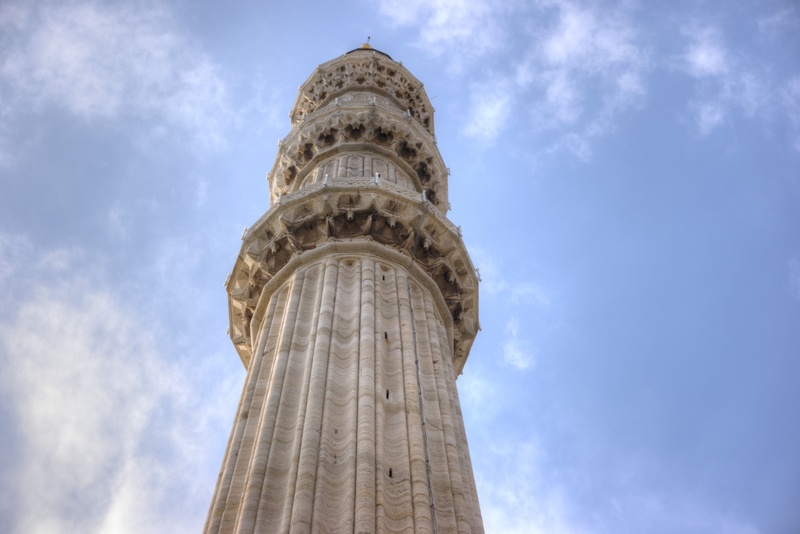 Even though the minarets of Selimiye Mosque are not the highest in the world, 70 meters is still a considerable height. 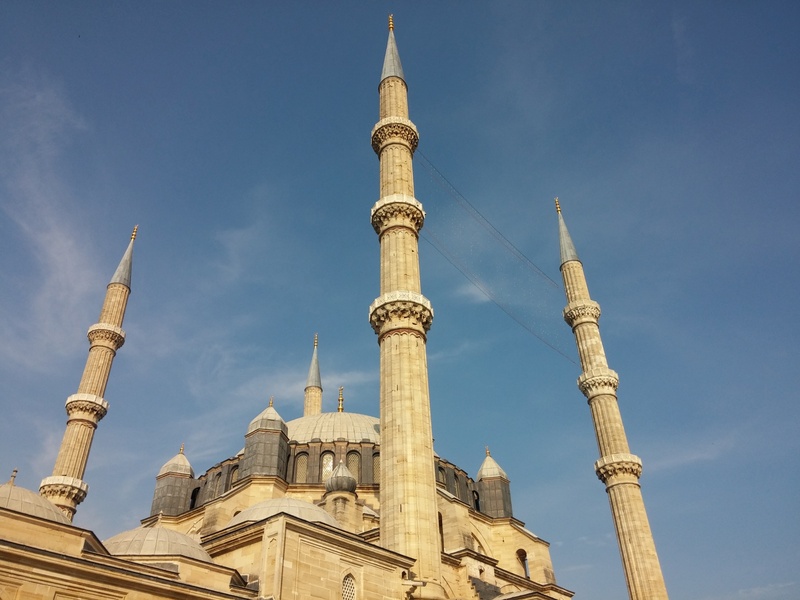 When Sultan Mehmed IV organised the wedding of his daughter Hatice, the acrobats had a performance that included tightrope walking on the line stretched between the minarets of Selimiye Mosque. The upside down tulips, which are a symbol of Edirne, have their origin in a tulip illustration engraved on a marble in the fountain right under the central dome of Selimiye. They are believed to symbolise the landlord of the tulip garden on which the mosque was built. Naturally, he was reluctant to give over his beautiful garden. The reverse tulip motif can be found in many places in the area of Selimiye, in various sizes and shapes. Selimiye Mosque has 999 windows in total. 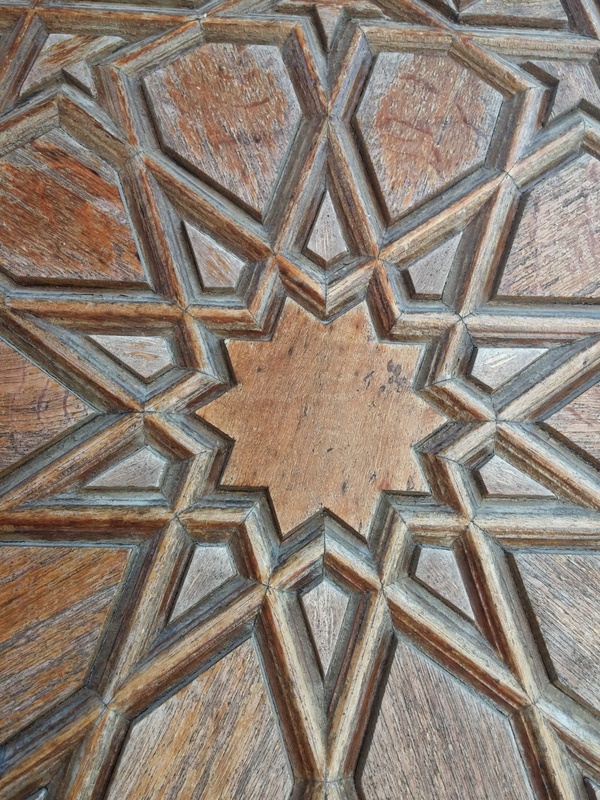 According to its architect Sinan, this number symbolises the perfectness of God. The entrance to the mosque is free of charge. Tourists are expected to visit the interior of the mosque when the prayers are not held. The main entrance to the mosque is through Selimiye Arastası Bazaar, where souvenirs, traditional rose soap and clothes are sold. If for some reason you want to avoid a large number of stairs, you may want to choose the back entrance instead. Selimiye Foundation Museum (tr. Selimiye Vakıf Müzesi) operates at the southern corner of the complex, in Dar'ül Kurra Medrese. The expositions demonstrate, among others, the restorations work conducted in the mosque, Iznik tiles, decorative elements, metal fittings, as well as a recreated scene depicting a lesson in the medrese. 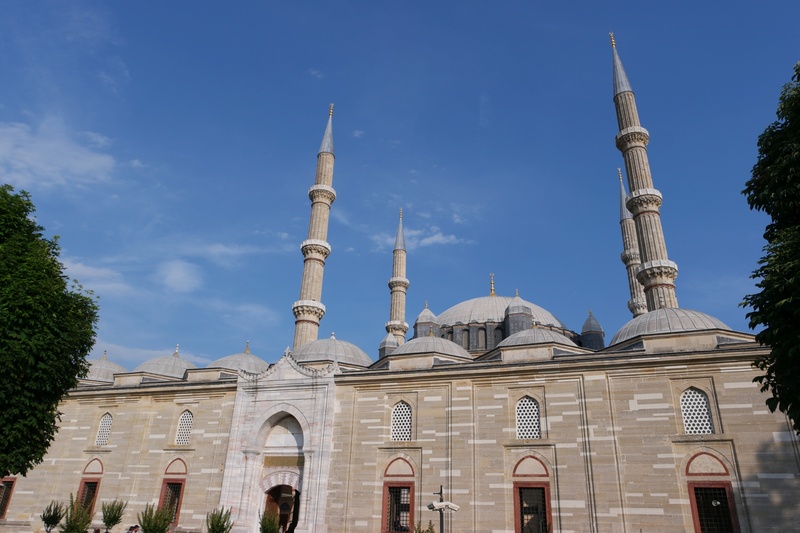 The Selimiye Mosque Complex also houses the Turkish and Islamic Art Museum, operating in the Dar-ül Hadis Medrese, in the eastern corner of the complex. 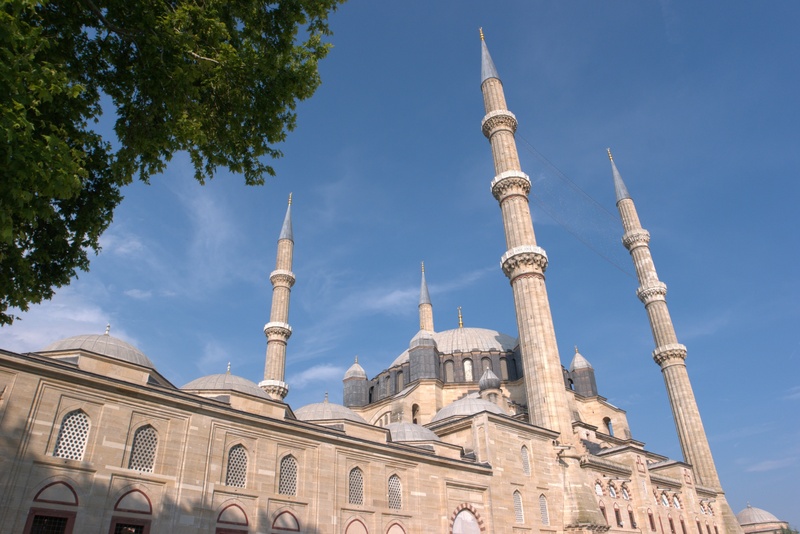 Selimiye Mosque is situated at the heart of the historical district of Edirne. The mosque complex stands on a square delimited by Mimar Sinan, Talat Paşa, Kıyık, Taş Odalar and Hatip streets. 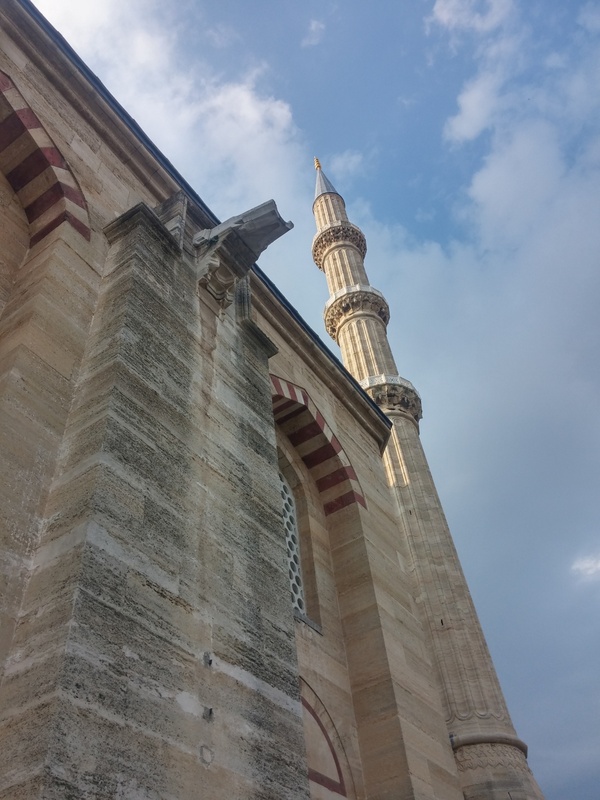 On the western side of the mosque, there is a statue of its architect - Mimar Sinan. 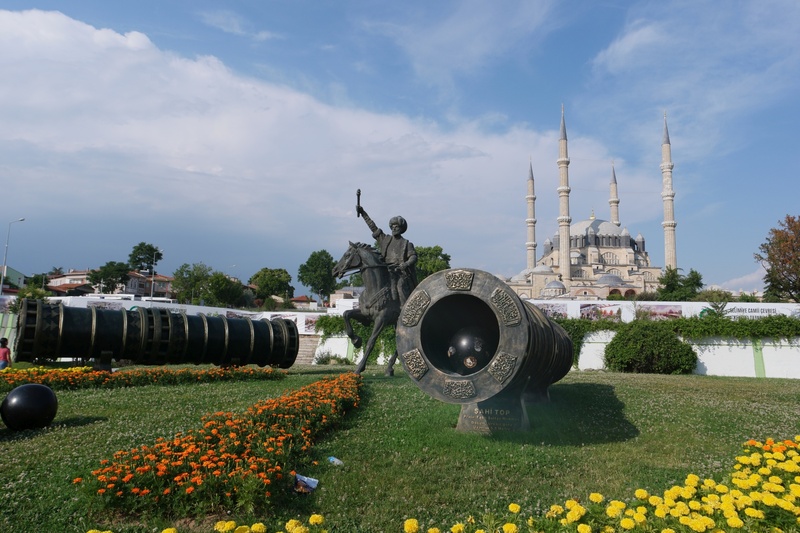 There's also a new addition - a monument of Sultan Mehmet the Conqueror together with two replicas of the famous Orban bombard, cast for the Ottoman siege of Constantinople in 1453. Orban, an iron founder Transylvania, managed to build the giant size gun within three months at Adrianople (now Edirne), from which it was dragged by sixty oxen to Constantinople. 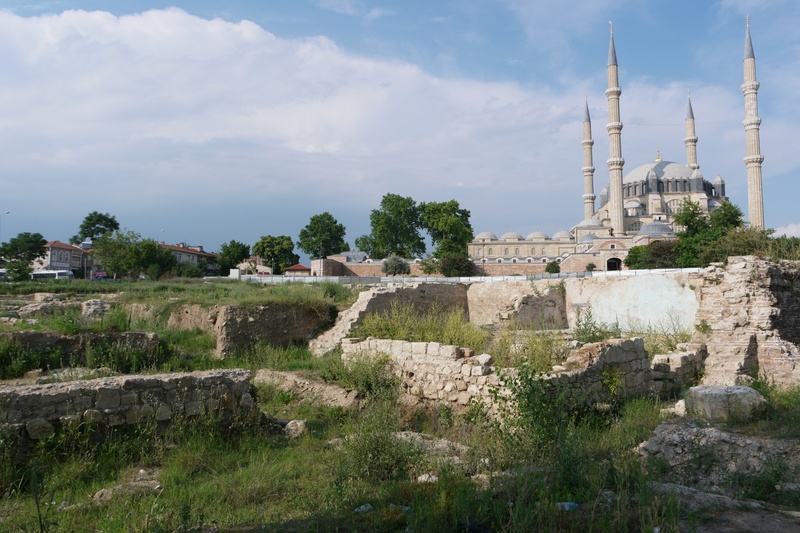 In the immediate vicinity of the mosque, to its south-west, there is an archaeological site known as Yemiş Kapanı Hanı where the ruins of an Ottoman caravanserai have recently been excavated. In August 2017, the mayor of Edirne, Recep Gürkan, announced that an archaeopark would be created there. At the back of the mosque, there is the building of Saray Baths - the part of original Old Palace that once stood at this location. The Archaeological and Ethnographic Museum is just 150 meters to the north-east of the mosque.